Cameras on the A68, A1 and the A697 in Berwickshire have all been targeted prompting the partnership to look at ways of increasing security. Colin McNeil, who heads the group, said that each attack had a significant impact. "Every time it happens it is inconvenient, it is costly and it is a crime," he said. "It is obviously something that we are concerned about to such a degree that we are now looking at potential ways of monitoring sites." One option is to have cameras trained upon the cameras. "There are companies there who would provide us with CCTV coverage of the cameras themselves - the cameras looking after the cameras kind of thing," said Mr McNeil. "We need to evaluate that on a cost basis and evaluate properly before we even consider it." 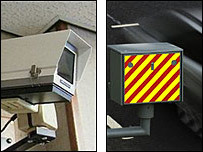 If approved, the cameras would be installed at sites where there have been particular problems in the past.